Large enterprises are striving to match smaller, more nimble rivals in business speed and agility, yet legacy systems and processes can effectively lock the business in place and stonewall change. Moving from ad hoc, spaghetti integrations to a digital backbone that orchestrates applications, data and processes delivers the dynamic new business capabilities that an enterprise needs to thrive. Novartis was looking for a suitable alternative to two on-premise middleware solutions that were expensive to maintain and lacked the required flexibility. For an organization interested in achieving greater agility at a lower total cost of ownership (TCO), the proposition of extending the use of traditional middleware solutions to cloud and mobile integration scenarios was not attractive. A shift to Dell Boomi AtomSphere integration PaaS (iPaaS) helped reduce development effort and delivered significant cost savings. The Dell IT team conducted a build-versus-buy comparison, and decided to go with Dell Boomi AtomSphere integration platform as a service (iPaaS) instead of building their custom integration solution. “It’s not easy to design an end-to-end solution, because we had to keep in mind the limitations, constraints, volume and authentication process, as well as how the business wanted to avoid duplicate orders,” says Sabu Syed, enterprise architect for Dell’s Business Information Exchange team, who managed the project. to help you digitally transform into a faster, more agile business. When applications are connected and data flows freely, your business can better spot and capitalize on opportunities. Rapidly innovate new engagement models that differentiate your business with customers and partners. The fast-paced digital world punishes high cost and delay. Fast, flexible and future-proof integration based in the cloud is crucial to swiftly unleashing value from your cloud IT investments and maximizing business impact. Put the customer at the center of the business by coordinating across diverse back- and front-office applications and utilize multi-source data to deliver a personalized experience. Drive digital transformation by harnessing rich, real-time data. Evolve from business guesswork to data-driven decision making and capitalize on IoT information to increase operational efficiency. In the digital economy, innovative businesses increasingly win with an agile enterprise architecture. Learn how you can eliminate rote operations with a disjointed IT infrastructure, fragmented workflows, ad hoc security measures, and poor visibility into customer needs. CIOs to stay relevant need to play a role in digital transformation. Success at transformation, today, depends on the CIO’s ability to drive their enterprise’s capability to integrate, create a multiproduct, multichannel experience, or a single view of customer or services that couple products with data. 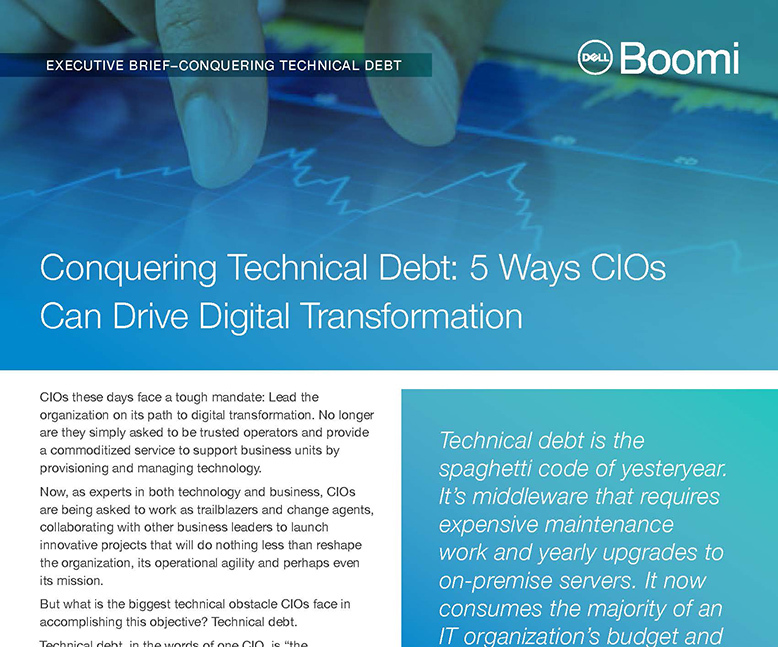 Learn here about 5 steps that CIOs can take to fix the ‘Tech Debt’ and transform their organizations. Fully capitalize on our industry-leading integration cloud to build your connected business. Available as a subscription, Dell Boomi Enterprise Innovation Services provides a package of integration services, support and resources, with the flexibility to customize to your specific needs. 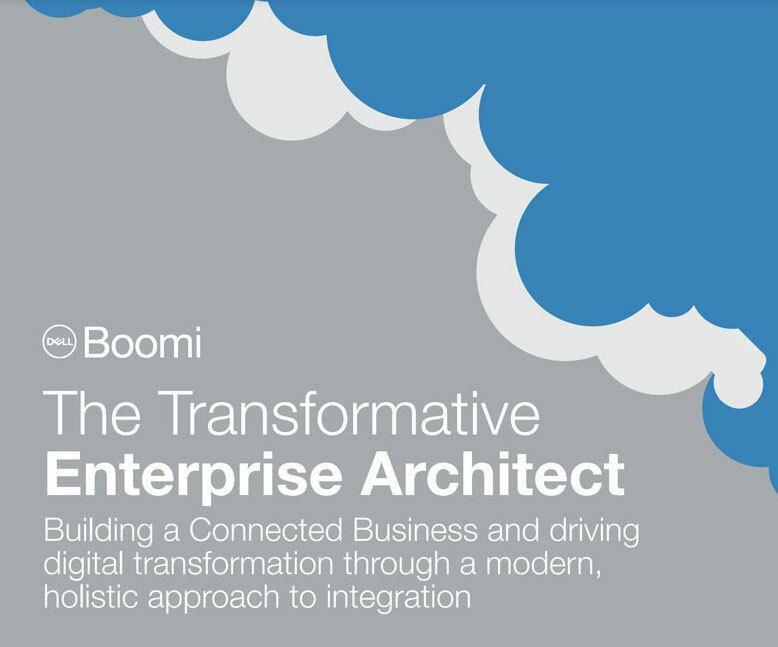 Harness the full power of your evolving IT architecture by partnering with Dell Boomi’s top architectural experts. Collaborate with Boomi technical, solutions, business and enterprise architects who offer extensive industry experience.